First and foremost, your marketing team will need to get an understanding of the mindset of your audience. With different businesses, this changes dramatically but remember the holidays are that time of each year when your team can show the fun side and enjoy it with your audience. Better you understand your audience, better will be the interaction. The element of surprise is essential and can be incorporated in content, offers, and Calls to Action (CTA). A surprise gift, offer or just a zombie-fever theme can attract attention. Expect the unexpected is the expression that should guide your audience to open your business windows of interaction with them. This is the time of the year when your marketing team members can bring out the silliest ideas out and get away with them. Packaging those ideas in a creative way brings out the laughter and some of those are set to go viral through your audience. Tradition is paramount in the holiday environment and it’s a good idea to ask your audience about their plans. People love to share their images of the decorations and other stuff they are indulging in. Depending on your business sector, you will collect a wealth of resources to share on social media and other platforms and the audience will flock to watch their own stuff and more. If your business sector deals with products or services, where your team can safely incorporate festive bits, you are in luck and take full advantage of it. 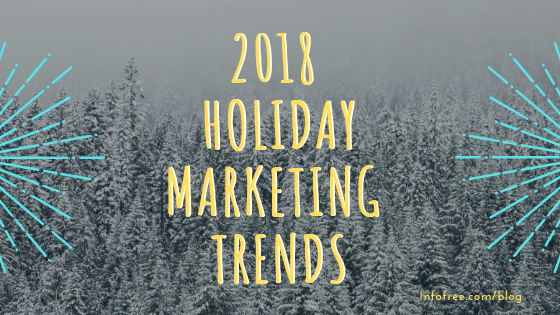 But if your sector has nothing to do with the holidays, it’s profitable to get innovative and find effective ways to use holiday marketing engagements. Your social media and other platforms can also be effective windows to share those on. There is still a lot of buzz that can be generated by even simply tweaking holiday elements to your branding. On your social media platforms, your team can change the profile photos or other noticeable characteristics to holiday themes. This entry was posted in infofree SMB Blog and tagged business leads, Database Marketing, email marketing, Find New Customers, grow my sales, increase my sales, infofree.com, lead generation, mailing lists, sales leads, Sales Productivity. Bookmark the permalink.